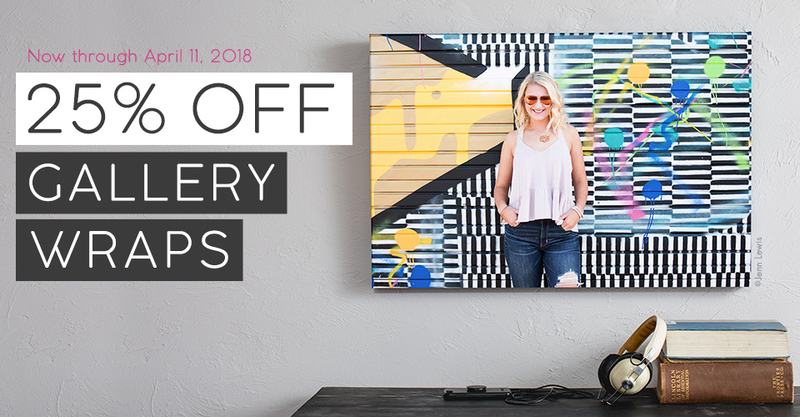 Now through April 11th, enjoy 25% off Gallery Wraps in ROES, Designer Plus and Web Ordering. Printed on archival quality canvas and wrapped around a sturdy stretcher frame, your image shines with brilliant color reproduction and arrives at your door in as little as 2-3 days. Upload your latest session and start your collection. Please Note: This discount will appear after the order is transmitted and received by the lab. Offer applies to standard size Gallery Wraps ranging from 8×10″ to 34×54″ (both 1.5″ to 2.5″ deep Gallery Wraps are included). Must be ordered through ROES, Designer Plus or web ordering. Gel coating is not included in the promotion. Orders placed prior to the sale will not be discounted. Offer ends April 11th, 2018 at 11:59 p.m. (Central).